The United States exported 97.0 million short tons (MMst) of coal in 2017, a 61% (36.7 MMst) increase from the 2016 level. Exports to Asia more than doubled from 15.7 MMst in 2016 to 32.8 MMst in 2017, although Europe continues to be the largest recipient of U.S. coal exports. 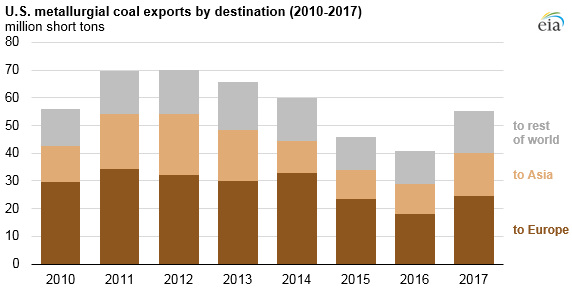 Steam coal, which is used to generate electricity, accounted for most of the increase in 2017 coal exports. India, South Korea, and Japan were three of the top five recipients of U.S. steam coal exports in 2017. India, the largest importer of steam coal from the United States, imported 7.6 MMst of steam coal from the United States in 2017—nearly three times as much as in 2016—mainly to fuel growing electricity capacity in the country. Coal-fired generating capacity in India has more than doubled in recent years to meet growing electricity demand. Although India produces enough coal to meet most of its domestic needs, a large portion of India’s new coal-fired power plants require coal with higher quality and energy content than the coal that is typically produced in India, resulting in these power plants having to import coal from elsewhere. South Korea was the third-largest recipient of U.S. steam coal in 2017, importing 5.9 MMst, up from 1.3 MMst in 2016. This increase was primarily because of South Korea’s plan to transition away from nuclear power, increasing its reliance on electricity generated from coal-fired power plants. Japan’s electricity generation is dominated by fossil fuel plants, as much of Japan’s nuclear fleet has yet to restart after the 2011 Fukushima Daiichi nuclear plant accident and resulting shutdown of the country’s other nuclear power plants. Japan depends on imports for more than 90% of its energy needs, and U.S. steam coal exports to Japan were 2.7 MMst in 2017, up from 0.6 MMst in 2016. Supply disruptions can also affect the amount and destination of U.S. coal exports. In 2017, disruptions to coal supply from Australia and Indonesia—traditionally the main source of coal for many countries in Asia—meant that many Asian countries turned to imports from the United States to offset these disruptions. Transportation costs also need to be low enough to make it worthwhile for producers to ship U.S. coal to Asia. Approximately 61% of U.S. coal exports to Asia originate from Norfolk, Virginia, and Baltimore, Maryland, a journey of up to 45 days. 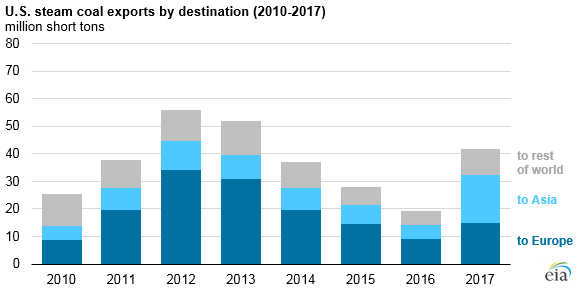 U.S. metallurgical coal exports also increased in 2017, reaching 55.3 MMst and accounting for 57% of total coal exports, up more than a third from 2016. Metallurgical coal is mainly used in steel production. Europe was the top destination for metallurgical coal exports, accounting for 45% of total U.S. metallurgical exports in 2017. The top six countries (Brazil, Japan, Ukraine, Canada, India, and South Korea) importing metallurgical coal from the United States accounted for more than half of all metallurgical exports in 2017. Five of these six countries, with the exception of Ukraine, were also among the top ten countries that exported steel to the United States in 2017.